This is a sponsored post for Head Country. All reviews and opinions expressed in this post are based on my personal view. 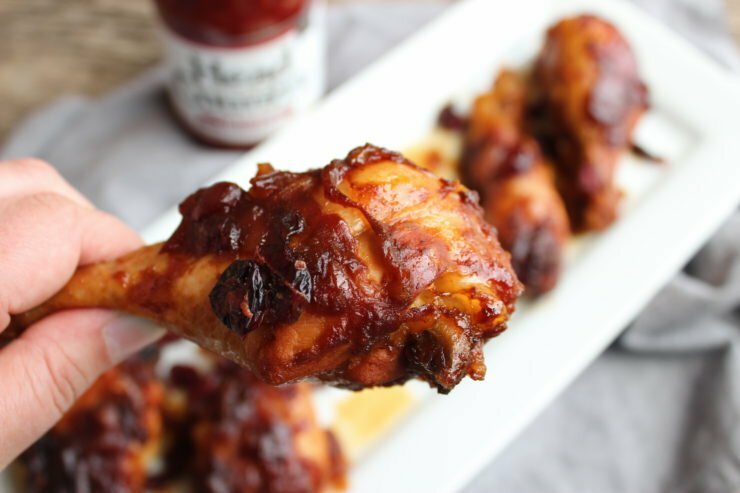 If you thought that barbecue is just reserved for grilling, allow me to introduce you to these Slow Cooker Cranberry BBQ Chicken Drumsticks made with the Best BBQ Sauce. While I love a good grilled BBQ Chicken Drumstick, I love a BBQ Chicken Crockpot recipe even better. Why? Because it’s just so fast and easy to make – not to mention you can just leave it and forget it. Throw these Four Ingredient BBQ Chicken Drummies into the slow cooker, go to work, come home, and enjoy a wonderful, effortless meal. Growing up, we ate barbecue at least once per week and it was almost always Head Country Bar-B-Q. Since my Dad (and myself) were such big BBQ fans, mom often made baked bbq chicken thighs, bbq chicken breast on the grill, and oven baked bbq chicken legs. 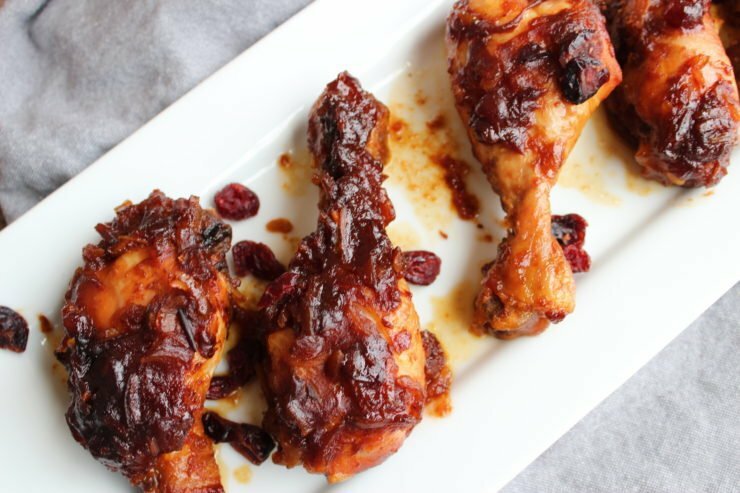 The baked bbq chicken legs were always my favorite, so I tapped into those childhood memories when creating these Crock Pot Cranberry BBQ Chicken Drumsticks. When Mom didn’t make BBQ at home or if we were traveling, Dad was adamant that he still get his weekly Bar-B-Q meal. As a result, we often stopped at tiny, hole in the wall, food trucks along our destination to satiate his BBQ craving. Being a BBQ fan myself, I always partook in whatever it was that he ordered. I will never forget the time we all got food poisoning from one such remote BBQ joint on our way to Branson, Missouri. That was a miserable trip and I think after that harrowing experience, my Dad decided to stick with our local BBQ restaurants and my Mom’s own, good easy barbecue recipes. If you’re all about simple and delicious, you’re going to love these Slow Cooker Cranberry BBQ Chicken Drumsticks. 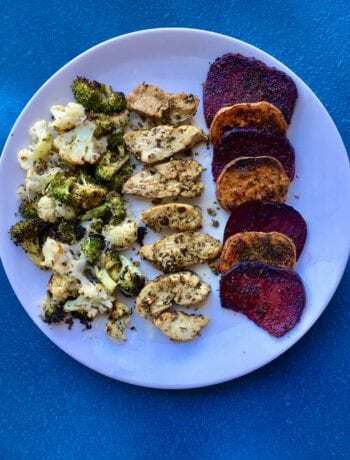 Having fast, easy recipes is always helpful, especially for this busy back to school season and with the holiday’s approaching. 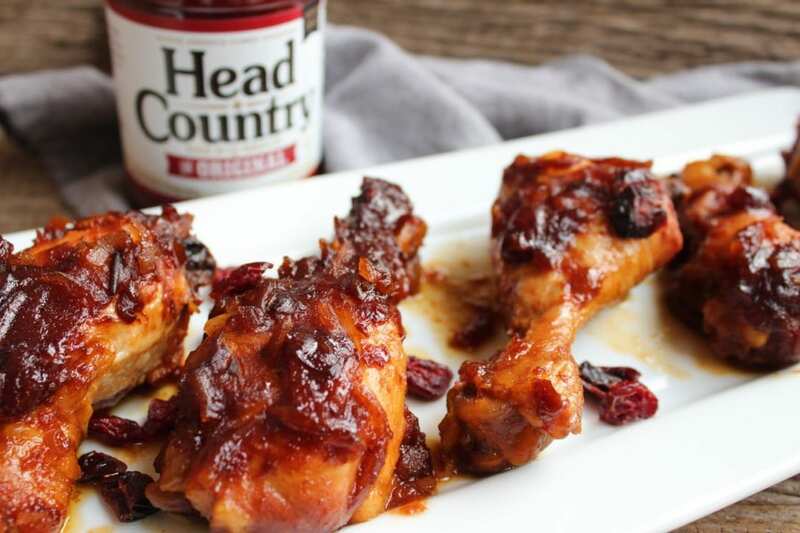 For this BBQ chicken recipe you’ll need chicken drumsticks, Onion Soup mix, Head Country Original Bar-B-Q Sauce and whole berry Cranberry Sauce. You will also need a 4 quart or larger slow cooker. Remove the chicken legs from the packaging, and lay them flat in the bottom of the slow cooker. I recommend using Organic Chicken Drumsticks for this easy bbq chicken recipe because the quality and flavor of the meat is better. If you’re doubling this recipe and need to stack the chicken legs, go right ahead. I had enough space to lay my chicken legs flat in the Crock Pot but stacking them won’t affect the way they cook. 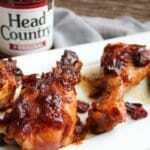 I created the BBQ sauce recipe for these BBQ Chicken Legs with our MVP, Head Country Bar-B-Q. I felt like their Original Bar-B-Q sauce had the perfect flavor for these chicken legs, and it didn’t disappoint! 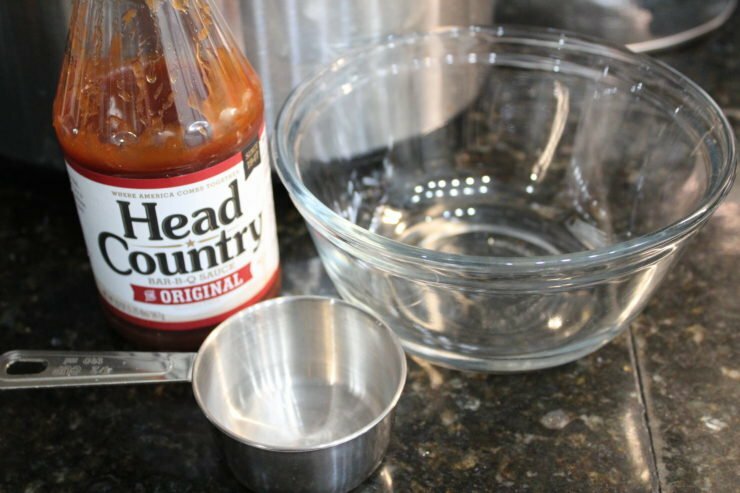 To create this sauce recipe, add 3/4 cup of the Best BBQ Sauce to a small, glass mixing bowl. 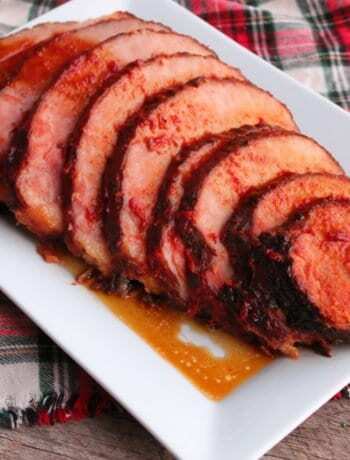 After adding the barbecue sauce, measure out 3/4 cup of Whole Berry Cranberry Sauce. 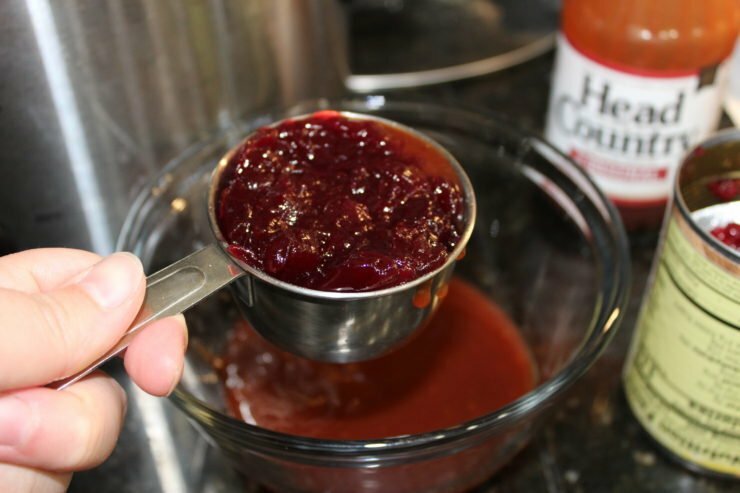 Adding the Cranberry Sauce to the BBQ sauce gives this mixture such a delicious, slightly sweet flavor! I also love cooking with Cranberry during the fall and winter months because there’s something so tasty and comforting about the tangy berries. 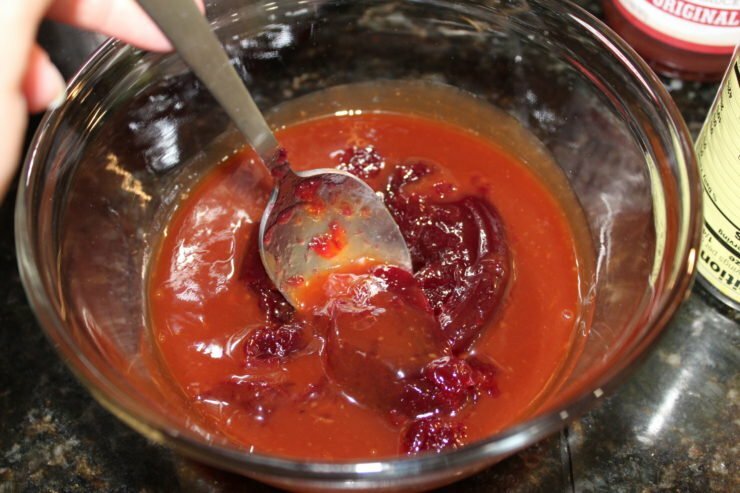 Stir the Best BBQ Sauce and the Whole Berry Cranberry sauce together in the small mixing bowl. Be sure to stir well until both ingredients combine and are smooth. 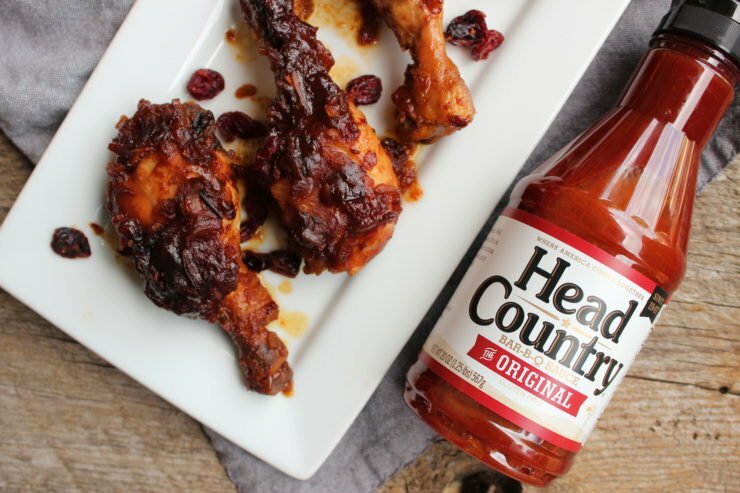 Head Country Original Sauce isn’t overly sweet or thick so it combines perfectly with the cranberry to make a wonderful, autumn inspired sauce. My secret to these Crock Pot BBQ Chicken Legs, really isn’t a secret at all. 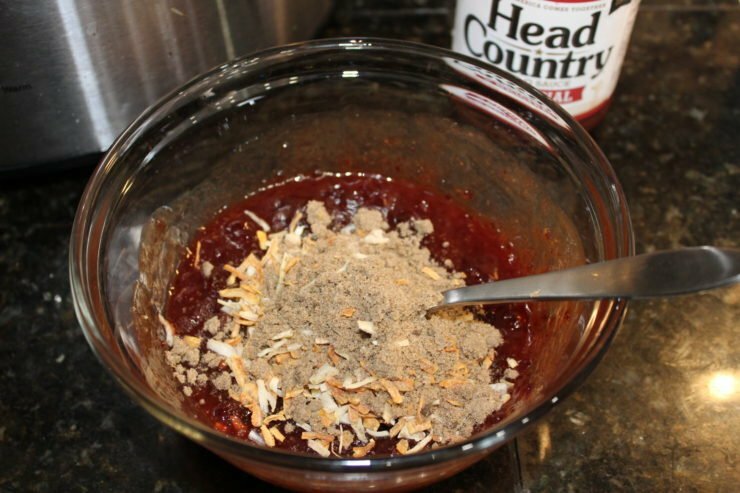 To incorporate a savory element to our Cranberry BBQ Chicken, I added one packet of Onion Soup Mix. Now that the sauce for these Cranberry BBQ Chicken Drumsticks is prepared and ready, pour it over the chicken drumsticks in the slow cooker. Use your spoon to spread it out evenly and just make sure all of the chicken legs are covered. Cooking chicken legs in my slow cooker is my favorite way to make chicken legs because they’re always so juicy and tender. 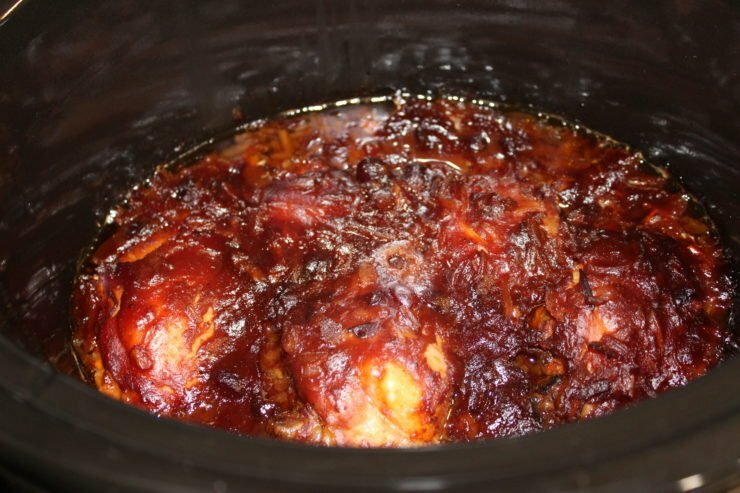 You really can’t go wrong with an easy crock pot recipe, barbecue sauce, and chicken drumsticks! Now that all of your ingredients are added to the slow cooker, place the lid on the slow cooker and set the heat to low. I recommend cooking these BBQ Chicken Legs on low for 6 hours, however, you can also cook them on high 4 hours if need them ready sooner. Pro Tip: Once the cooking process begins don’t take the lid off of the crock pot! Removing the lid while the slow cooker is cooking releases the steam out of the slow cooker, causing it to take up to 30 minutes to regain temperature. 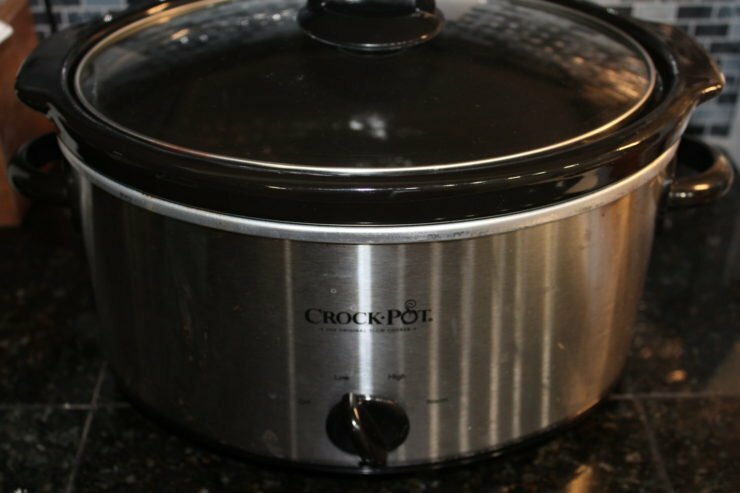 If your crock pot is working hard trying to bring the temperature back up, it will just take longer to cook, so avoid removing the lid for a peek! Once the cooking cycle is complete, turn the slow cooker off and remove the lid from the slow cooker. These BBQ Chicken Drumsticks will be so tender, the meat will likely fall right off the bone as you’re serving them! If you’re like us, you love good comfort food served up with your BBQ chicken. 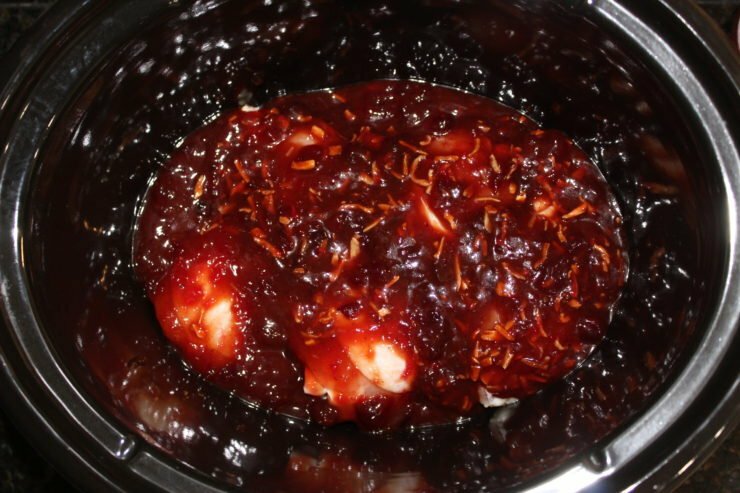 I served our Slow Cooker Cranberry BBQ Chicken Drumsticks with Homemade Mashed Potatoes and BBQ Baked beans making our dinner simple, easy, and delicious! Some other recommended side items are: Potato Salad, Corn on the Cob, and Broccoli Pasta Salad. 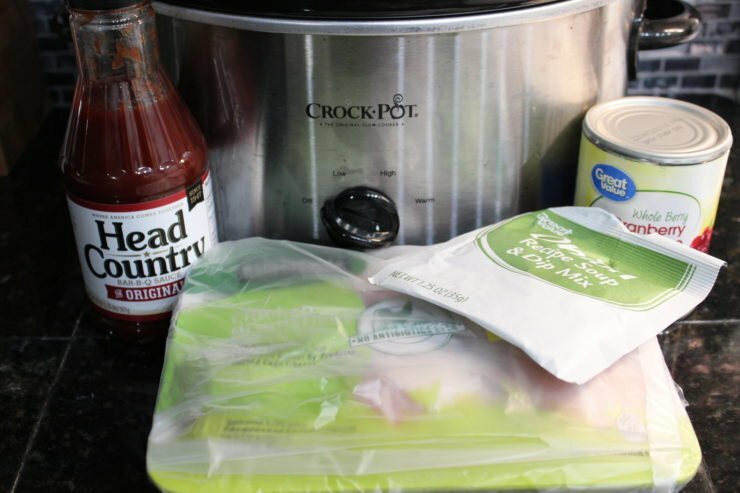 Any time I create a crock pot recipe such as these Crockpot BBQ Chicken Legs, I usually get asked a few questions regarding cooking in the crock pot. The answer to that question is, “Yes!” You can put these Slow Cooker Cranberry BBQ Chicken Drumsticks in the crock pot completely frozen. I recommend if you’re using frozen drumsticks, increase your cooking time by two hours. Using frozen chicken drumsticks in your slow cooker is actually a great way to save time if you forget to thaw your chicken out the night before. As always, thank you for stopping by my kitchen to visit with me and cook together. I hope you always know how much I love having you here! If you love these Slow Cooker Cranberry BBQ Chicken Drumsticks, please feel free to leave a comment and let me know. I love hearing from my readers and I’m always open to any feedback or tips you want to give! 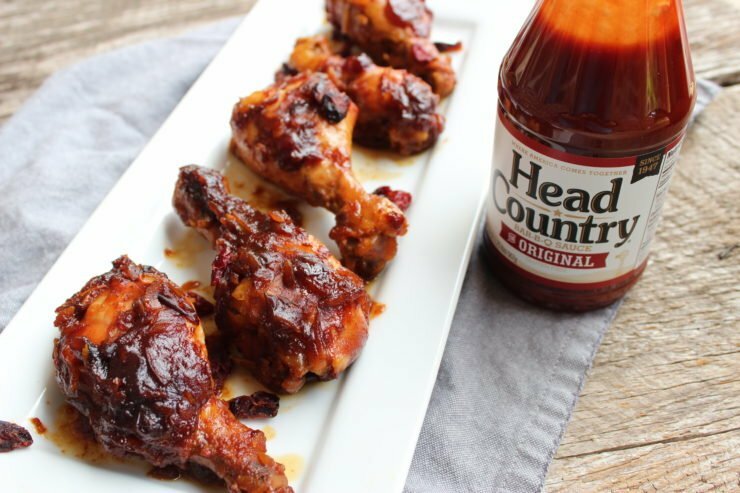 Slow Cooker Four Ingredient BBQ Chicken Drumsticks include Head Country Original Bar-B-Q sauce, hints of cranberry, and the savory blend of onion, all cooked to juicy, tender, perfection in the slow cooker. BBQ Chicken Drumsticks are the perfect fast and easy fall dinner dish! 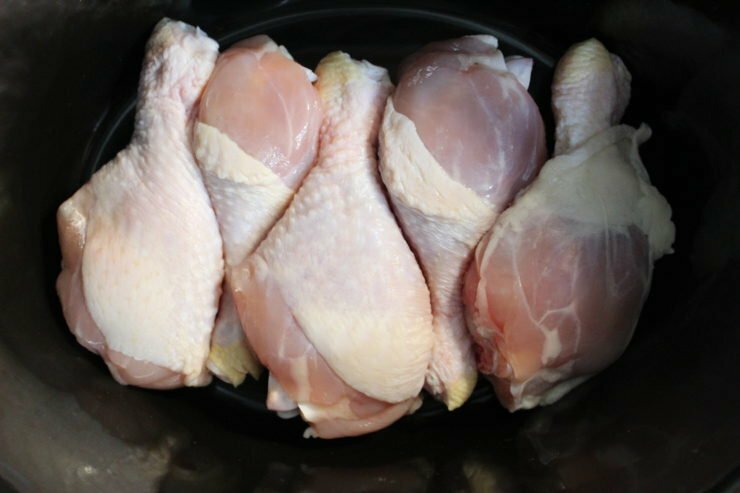 Place the chicken drumsticks in a 4 quart or larger slow cooker. 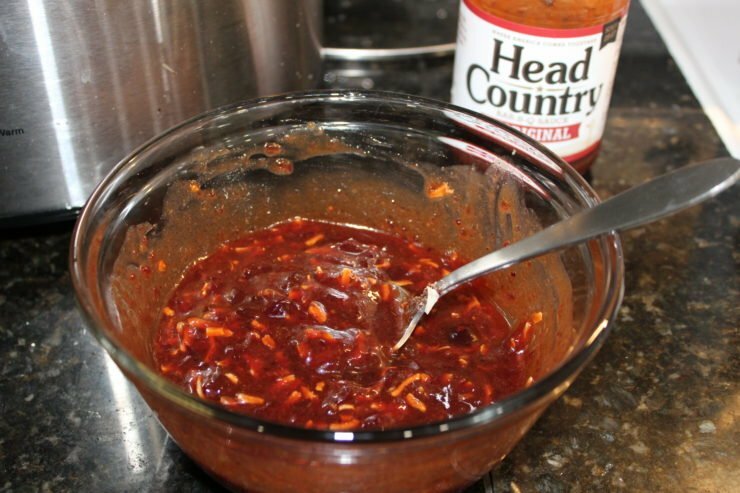 In a small bowl, combine the Head Country Original Bar-B-Q sauce with the cranberry and onion soup mix. Stir until all ingredients are smooth and well combined, then pour the sauce over the chicken drumsticks. Cover and cook on low 6 hours or high 4 hours. Remove from the slow cooker, serve, and enjoy! This looks so easy and delicious – a perfect weeknight meal. Pinned for later. I would be so honored if you would share it (and some of your other recipes too) at our What’s for Dinner party! I would be delighted to share my recipes at your What’s for Dinner Party – thank you so much for inviting me! So glad you joined us!! 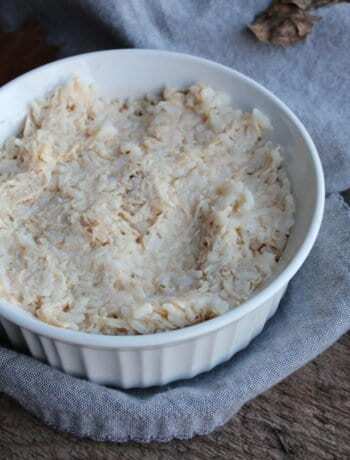 I can’t wait to try this – and thanks for sharing some of your other amazing recipes too! Hope to see you next week again! We love using cranberries in the fall and winter and this combination paired perfectly! Your Cranberry BBQ Chicken Drumsticks will be a perfect welcome for fall! Hope you are having a great week and thank you so much for sharing with us at Full Plate Thursday! I haven’t tried any substitutions in this recipe, but I think dried or fresh cranberries would work beautifully! If using fresh cranberries, I would suggest putting 3/4 cup fresh cranberries in a blender or food processor with 1/4 cup water and 2 tbsp sugar and blend them to create a “sauce”. I would taste them after blending to see if they’re sweet enough, and if not, just add more sugar. Hey ya'll! My name is Amy and I'm so glad you dropped by to visit my little kitchen. 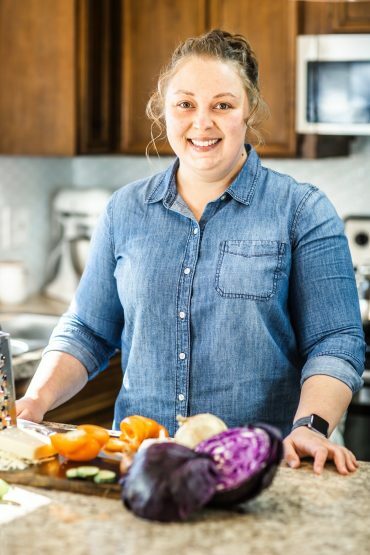 I'm the recipe developer and photog here at The Speedy Spatula where you can find fast & easy family - friendly recipes. Grab a cup of coffee and stay awhile! Copyright 2017 - TheSpeedySpatula. Designed by SoloPine. All Rights Reserved.